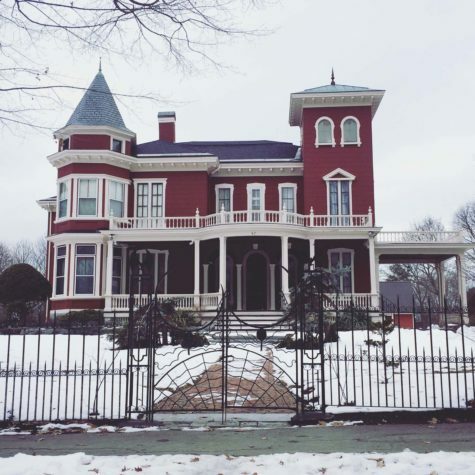 Standing outside the gates of Stephen King’s home. Paul Bunyan is iconic in the city of Bangor. 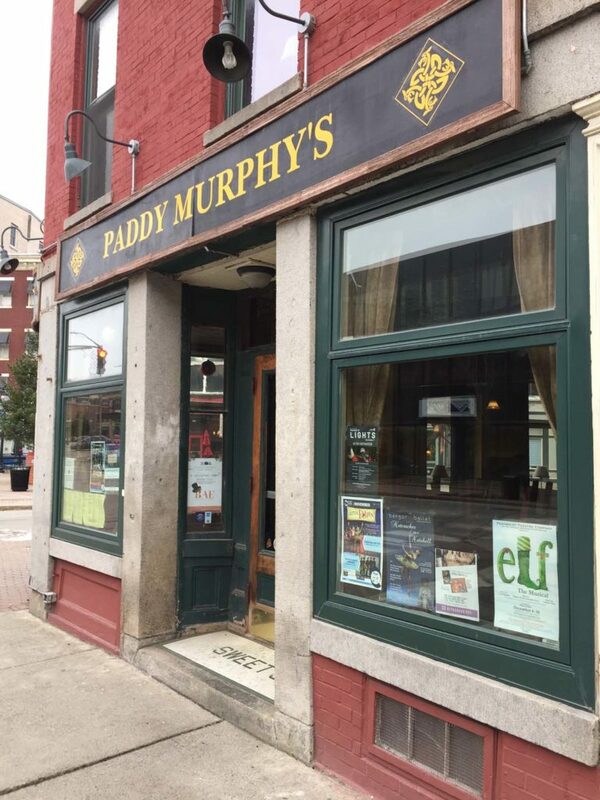 Paddy Murphy’s Pub: home of the best local corned beef and cabbage. 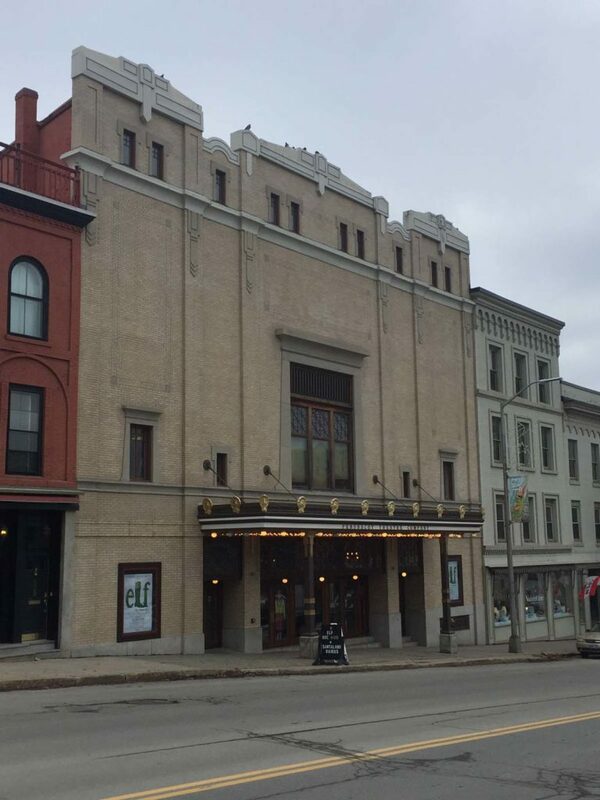 An outside glimpse of the Penobscot Theatre and historic Bangor Opera House. 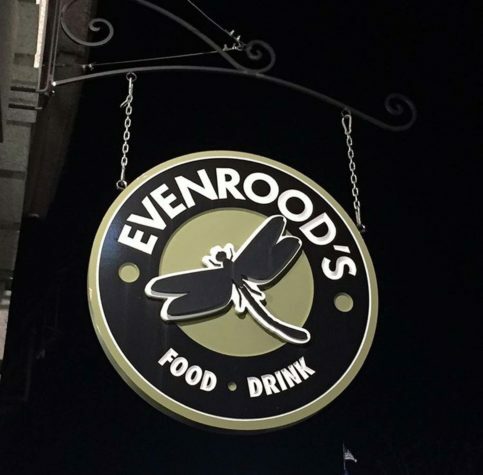 Evenrood’s was once a Merchants Bank Building and has their dining room in the former vault. 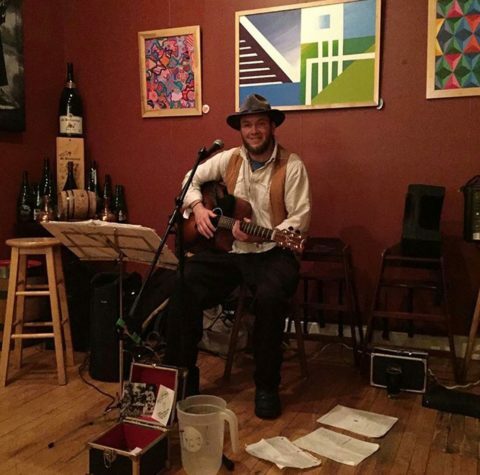 Troy Youngblood performs acoustic blues at Nocturnem Draft Haus. 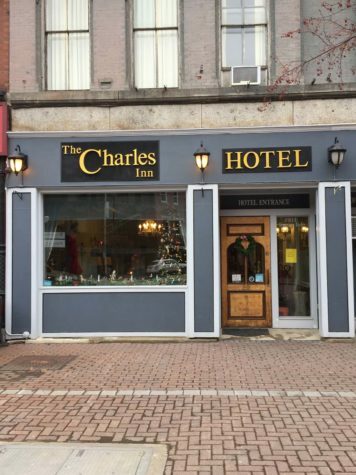 The Charles Inn is central in Bangor and the perfect place to stay and see all that the city has to offer. 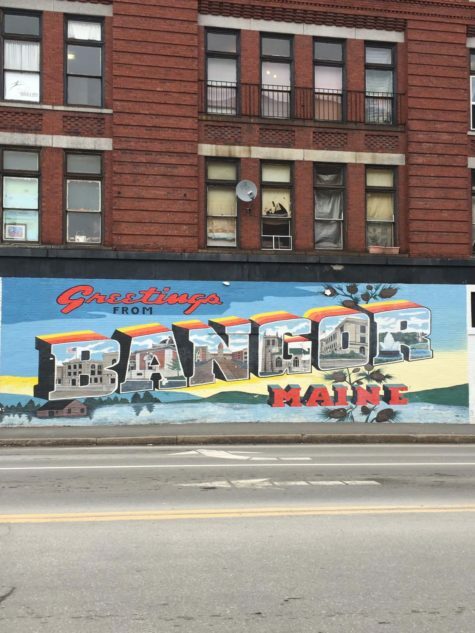 Located on the Penobscot River, Bangor’s downtown is vibrant with restaurants and shops; plenty of cultural and outdoor recreation experiences round out the city’s charm. My first stop in Bangor is with Michelle Chase and Karen Tucker of Anchor Design Company, a kitchen design firm with a showroom on Stillwater Avenue. 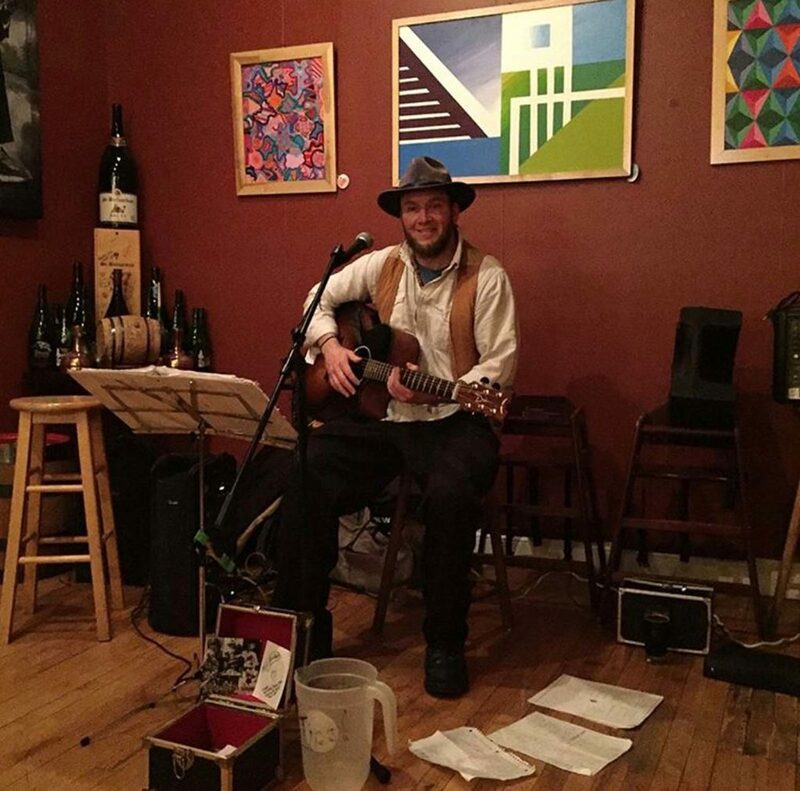 We talk business, Bangor, and what I should do this weekend. 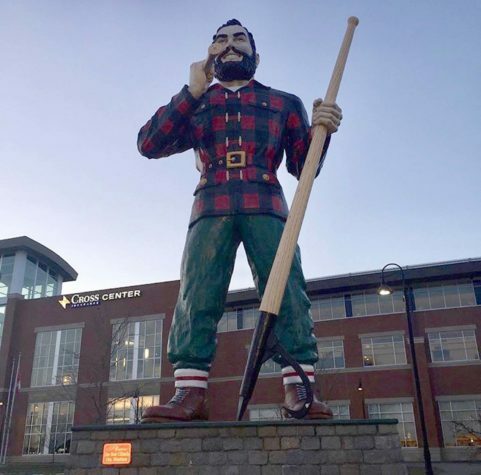 At 31 feet tall, the Paul Bunyan statue in front of the Cross Insurance Center is huge. I take a couple pictures before heading downtown to my home base for the weekend: The Charles Inn. My room has a great view of the Christmas tree downtown, and it’s a quick walk across the street to Evenrood’s. Featuring a beautiful dining space and outdoor seating, Evenrood’s opened in the former Merchants Bank Building nearly four years ago. Along with offering a menu of classic American cuisine, the restaurant features a bank vault that’s been converted into a dining area. I pair my pan-seared ahi tuna appetizer with Orono Brewing Company’s Kindred and Kind, a double IPA. Then, wanting to try as many restaurants as possible, I bounce over to Blaze, known for its wood-fired pizza, and enjoy some delicious haddock tacos. My final stop is on the recommendation of Michelle from Anchor Design. Nocturnem Draft Haus is just across Broad Street and has 14 draft lines that rotate. This is the perfect spot to close my evening as I relax and enjoy a solo performance by Troy Youngblood. I was hoping to see a performance by the Penobscot Theatre Company at the Bangor Opera House, but there’s no show this week. Instead I arrange to visit the theater with Bari Newport, the theater’s producing artistic director, and the marketing director Magnus Stark. The theatre company is preparing for a performance of Elf: The Musical, so the historic opera house is full of cast and crew getting ready. The company’s current season runs through May. 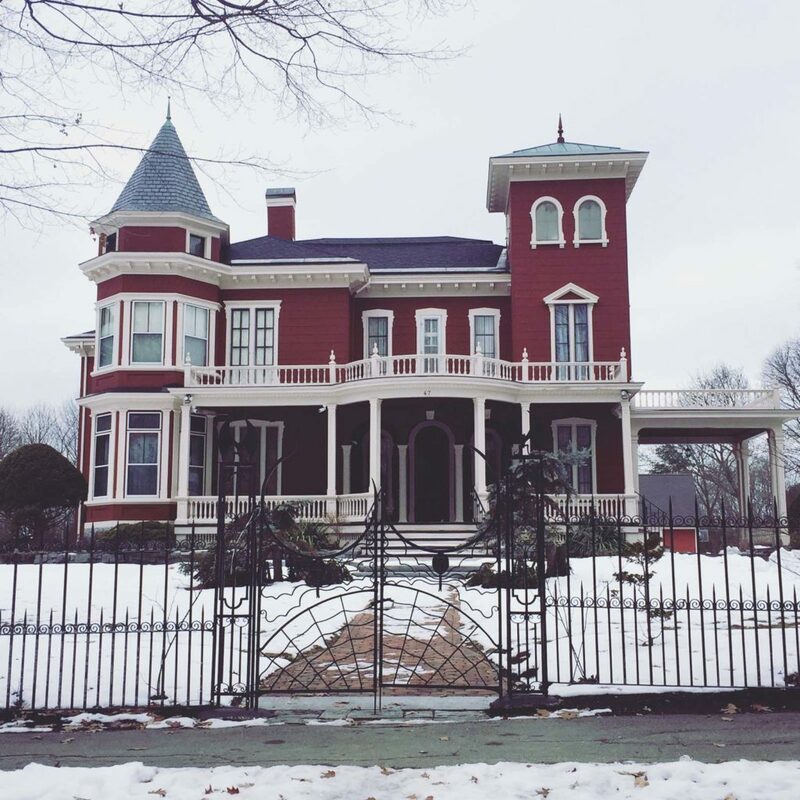 Another stop on my list is author Stephen King’s home, a 20-minute walk west of downtown. On the way I stop at the police department to take a photo of the Duck of Justice, a stuffed duck that’s become internet famous thanks to the Bangor Police Department’s popular Facebook page. The horror author’s home has a distinctive and appropriate wrought-iron fence shaped like spider webs, with winged creatures at the top. Paddy Murphy’s is a local hangout where I make some new friends and enjoy corned beef and cabbage with another beer from Orono Brewing Company. The Rotary Club of Bangor’s Festival of Lights is this evening, and my girlfriend is driving up to Bangor to join me for it. My girlfriend meets me downtown, and we’re joined by Magnus Stark from the theater and some of his friends, including Lance and Amy Blackstone, who live nearby. Amy, a sociology professor at the University of Maine, studies and writes about the choice to remain child-free. We watch the parade from the Blackstones’ house, which gives a view over the crowd outside. Next, my girlfriend and I go to Novio’s, a restaurant on Hammond Street, for a romantic dinner of homemade pasta and wine. There’s a dusting of snow downtown when we wake up. After checking out, we walk to Bagel Central for breakfast. The popular bagel shop is packed, but we find a seat near one of the large windows that look out at the street. I order a coffee and a small breakfast sandwich. Before leaving, I make my way up Main Street to get a picture of the mural at the corner of Union Street, painted to look like a postcard that says “Greetings from Bangor, Maine.” The snow is starting to turn to freezing rain, but I get a couple of shots when the clouds part for a bit. On my way home, I think about all the new places I saw and the new friends I made during my weekend in Bangor. 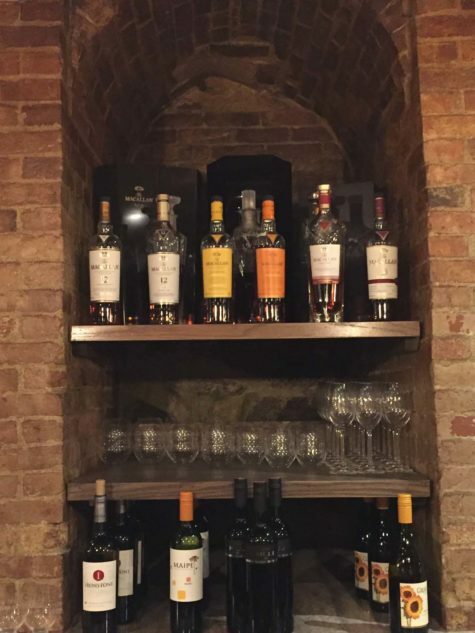 The top-shelf liquor lineup at Novio’s. The painted Bangor sign welcomes all who visit.